Beachside Escape is exactly what you think of when you think beach vacation!! Located in one of the most desirable areas in St. Thomas on the East End, this spectacular three bedroom, three bath condo sleeps eight and is right on the beach! 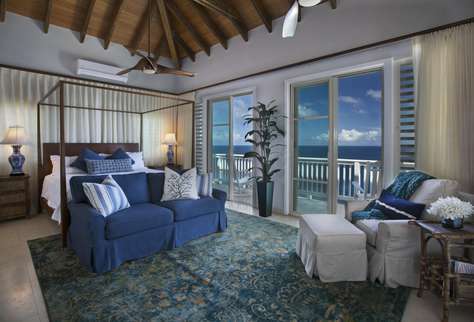 Luxuriously appointed with tropical furnishings, amazing views and stunning sunsets! * Restaurant delivery service, several options to choose from! Enjoy the highly recommended restaurants the resort has to offer, either at the fine dining Caribbean Fish Market, known for its mouth watering seafood, or at the casual Sangria's Beachside Bistro...be sure to try their scrumptious conch fritters or fish tacos! Or if you'd like to eat in, try our restaurant delivery service! New featured amenity and service on island, subscription not provided by most other condos! You will never need to leave the resort and Beachside Escape, but if you choose to, you are only minutes away from the conveniences of Red Hook... shopping, bars, restaurants, Ferry to St. John, postal service, and medical center. We can assist in grocery delivery to conveniently stock your fridge prior to your arrival, as well as arrange for private catering/chef services, private massage therapist, and mid stay housekeeping services. Advisory: We only accept payments made through secure payments platforms and do not accept wire transfers so be cautious scammers asking for bank account information! It is best to book directly through VacationVI where you will pay the lowest rate without excess booking fees! This luxurious 5100 square foot three bedroom, plus an office with WIFI, and a sitting room adjoining the master bedroom that can serve as an additional bedroom has a basement apartment that adds an additional bedroom with 300 sq feet right off of the pool area. The entire Villa is handicap accessible with ramps to all area inclusive of a terrace that is an additional 900 sq feet area for relaxing, sun bathing and partying. This allows all ages to enjoy this residence for there are no areas that are inaccessible from the parking spaces to the pool to the terrace. 'Blue Serenity' is spread over 2.5 beautiful acres, with lush landscaping and lawns dotted with shady trees and flowers, and surrounded by fencing and walls built with native bluebit stone for privacy and security. An electronic gate offers privileged access to guests, while the pool man, gardener and other villa staff enter through a second gated entrance to the property. 'Blue Serenity' is an expansive showplace replete with elegant and comfortable furnishings, plentiful amenities, artful lighting inside and out, and secluded privacy, yet you can take the staircase down to the beach for excellent snorkeling or lunch or dinner at Sunset Grille at Secret Harbour, or drive a few minutes to varied East End restaurants, bars, shopping, more good beaches, The Ritz-Carlton Hotel and Club, and to the nearby ferry dock serving St. John and the British Virgin Islands. Five stars! 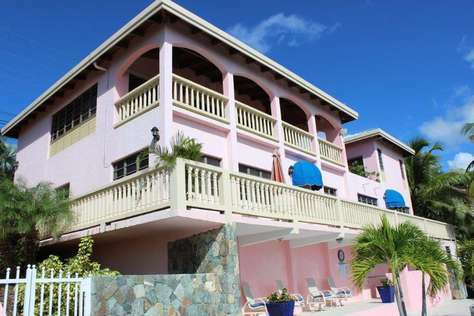 Tastefully decorated in pinks, pastels, and the colors of the Caribbean, Azula Vista on St. Thomas is an ideal retreat for families. With four bedrooms and five bathrooms, there is plenty of space to enjoy each others company and then spend some private time alone as well. It provides a living area that includes a cathedral ceiling, glass walls, and a dining alcove that seats eight. This villa has a casual charm with comfortable furnishings. It also has a built-in charcoal grill near the pool and garden area, which makes it easy and fun to grill out as often as you would like. Azula Vista Villa is located in a terrific spot that is close to beaches and water sports activities when you want to fill your days with sand, sea, and sun. You can reach jet-skis and kayaks via just a short drive; there is something for everyone to enjoy. ome villas simply stun you with beauty, and Palms at Morningstar is no exception. 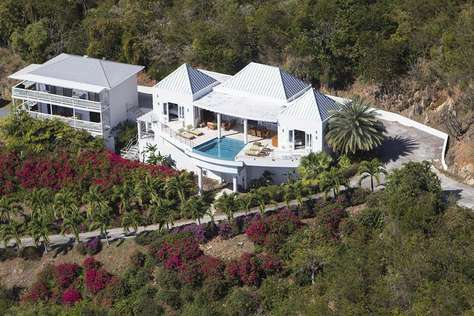 It is newly built, and the fresh, modern design is a gorgeous sight on one of Charlotte Amalie's luscious hillsides. With its elevation, guests get an endless view of the landscape and turquoise-blue sea from just about any room inside, but take it all in from the infinity pool for an extra dose of beauty and luxury. Or just open up your bedroom doors to the pool deck and bask in the Caribbean glory right from you bed. Palms at Morningstar is only a few minute's drive from Morningstar Beach and all the restaurants and shopping spots, so whether you want to hang around the villa or spend time out, Palms will completely satisfy! 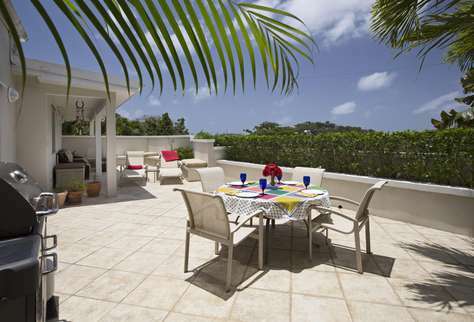 Villa L'Esperance, is a contemporary 5-bedroom villa located in South Side within minutes of the beach and shopping. Originally the home of a 1950’s movie actress, this property high on Flag Hill has been beautifully renovated. The great room has floor-to-ceiling windows, which open to the views. The gourmet kitchen and expansive family room open to a spacious stonework patio (home of the famous flag of Flag Hill) and a breathtaking view. The main level has 3 bedroom suites, including a master suite with its own secluded sitting room. Two bedrooms have king-size beds, while the third bedroom has twin beds that can be made into a king-size bed. The main floor also contains a media room with a large-screen TV, extensive movie collection, full bathroom, and sofa bed. The media room may be used as an extra bedroom. The other 2 bedrooms are located on the lower level and overlook the pool. One bedroom has a king-size bed, while the other bedroom has twin beds that can be made into a king-size bed. Each bedroom enjoys direct access to an exterior deck and its own bathroom. A deck surrounds the pool, which has an adjacent shaded pool house with refrigerator, gas grill, and full bathroom. Near the pool deck is a stonework pathway lined with diverse tropical plantings and citrus trees. A separate building houses a well-equipped fitness area. This fully air-conditioned villa also has an automatic generator, outdoor shower, WiFi, gas grill, and PlayStation 2. A small cottage on the far side of property houses the villa’s 2 caretakers and their dog. This villa requires a 7-night minimum stay during Thanksgiving (10 nights during Christmas) and a $1,000 security deposit. A 4-wheel drive vehicle is recommended. 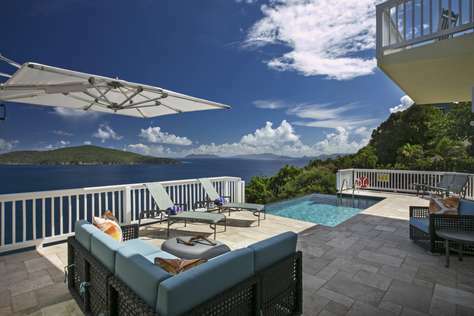 Blue Canopy is a delightful two bedroom cliff side villa that provides commanding views of Charlotte Amalie Harbor, Water Island, Hassel Island, the Atlantic Ocean and the distant Spanish Virgin Islands. Ideally perched above The Marriott Frenchman’s Reef Resort, Blue Canopy is perfectly situated to watch the cruise ships come and go. Just minutes away is Morningstar Beach, shops, restaurants and waterfront activities in Havensight and Yacht Haven Grande. This villa was designed for easy living and to capture sunlight and water views. All living areas are on one level. An open floor plan, vaulted ceiling with integrated sky lights, and walls of sliding glass doors combine to create a sun drenched great room. The main living area is slightly sunken and dominated by a large U shaped sofa situated to capture the west facing views. Adjoining the main living area is the indoor dining area which can comfortably seat six under either natural light or overhead lighting. The living areas are fully air conditioned and adorned with bold giclees by local artist Don Dahlke. The bright and airy kitchen is well equipped with stone countertops, a double basin sink, electric stove and oven, microwave oven, large refrigerator and dishwasher. Other amenities include coffee maker, blender toaster and food processor. Master bedroom - King size bed, two end tables with reading lamps, ample closet space, 24” flat screen TV, overhead lighting, ceiling fan, sliding glass doors open to balcony, sun screens. Excellent views. Fully air conditioned. The ensuite master bathroom features a large shower and double basin vanity. The second bedroom has a king size bed with mosquito netting. There are end tables with reading lamps, separate A/C, ceiling fan, 24” flat screen TV and ample closet space. The ensuite bathroom offers excellent natural lighting from skylight with a large shower and double basin vanity. 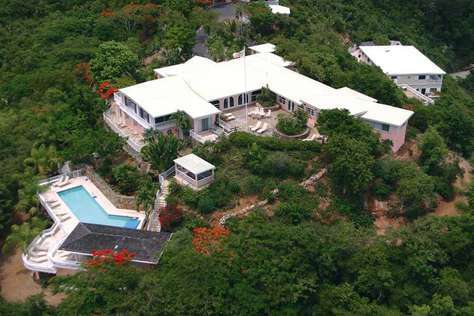 Magens Hideaway is a private spacious five bedroom villa on Peterborg Peninsula of St. Thomas with views of world famous Magens Bay and also Hans Lollick. The huge Master Suite (separate and private pod) features a comfortable king sized four poster bed with supple Egyptian cotton sheets, complete with a flat screen TV, Bose Sound System, lounge area with day bed and writing desk that overlooks the large heated pool, sweeping views of British Virgin Islands and a lush tropical garden. The Master Suite affords itself to peaceful tranquility and awe inspiring sunrises. The expansive bathroom offers a majestic walk-in shower with views of the Caribbean Ocean. 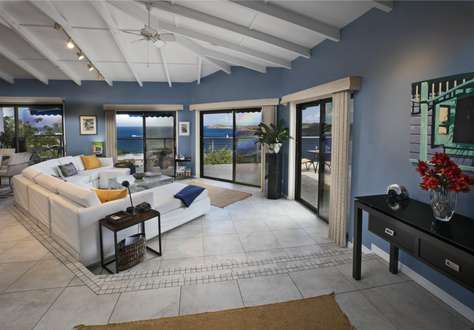 The third pod hosts four bedrooms on two floors, looks down over Magens Bay with stellar sunset views from the wrap around porch. The two bedrooms upstairs have private bathrooms, while the two bedrooms downstairs share a bathroom. Bay View Bedroom hosts a king sized bed with a TV, refrigerator and full bath. 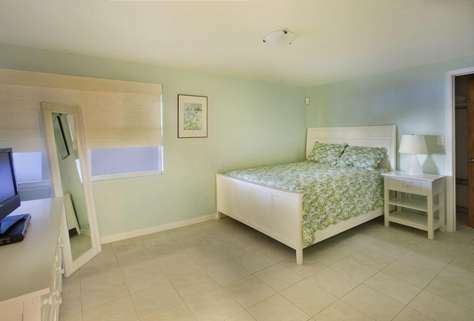 The Ocean View Bedroom accommodates two full/queen beds, TV, refrigerator and full bath. Downstairs, you'll find two more large bedrooms and a private patio; perfect for a family with young children. The rooms are connected with a full bath; the larger bedroom has a king sized bed, TV and day bed, with the second bedroom offering two twin beds and a TV. You'll want to spend your days lounging by pool enjoying the brilliant sun and gentle warm breezes flowing across the entire property. You can listen to your favorite music through the outdoor Bose Sound System, all while taking in the panoramic views. The unique rock formations in the outdoor space complement the lush garden of orchids, palm trees, dragon fruits and night blooming euphoria, this is truly a Caribbean paradise awaiting your arrival. Advisory: We only accept payments made through secure payments platforms and do not accept wire transfers so be cautious of scammers asking for bank account information! The property includes approximately five-hundred feet of prime ocean frontage and its own beach, just a walk down the steps. 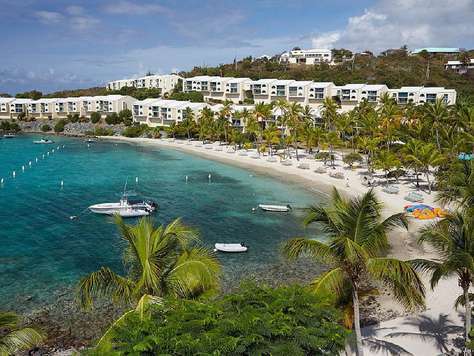 Our villa looks over a pristine coral reef that flourishes in these crystal clear Caribbean waters, teeming with life. 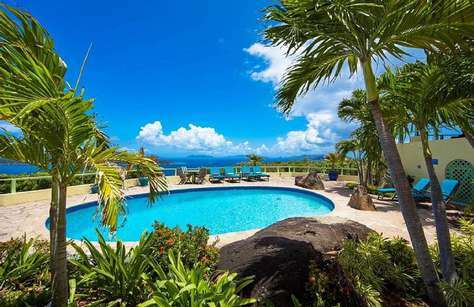 There are very few rental homes in all of the Virgin Islands that can compare to our property as a charming and luxurious tropical retreat, with its own secluded beach and reef. 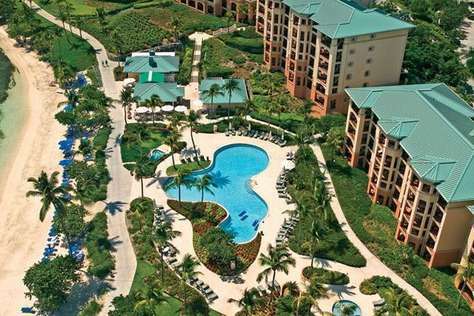 As such, it is a very special place for families to unwind and share a memorable vacation. 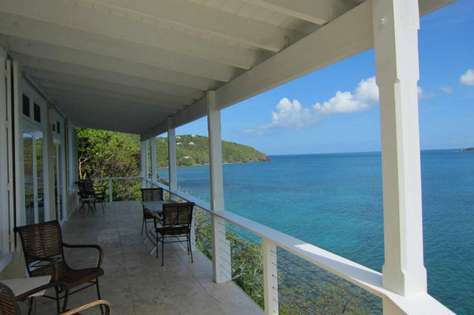 Our views of the stunning waters of Magen’s Bay are truly exceptional. 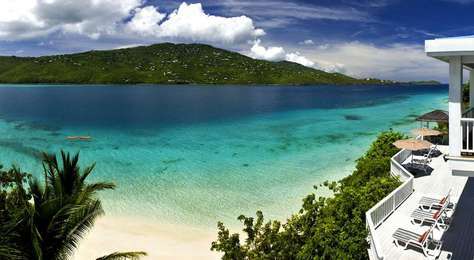 Magen’s Bay is a treasured Virgin Island nature preserve and, as such, has no hotels nearby and very limited residential development on its shores, particularly its western shore. Magen’s Bay Beach is a magnificent natural landmark that stretches for over a mile along the south end of the bay, renown for its white sand and turquoise waters. Behind the beach stands a tropical forest, which gradually rises up a mountain, filled with lush vegetation and fascinating wildlife. This beach was recognized as one of the top ten beaches in the entire world by National Geographic. The Edge of Paradise sits on the west side of the bay. 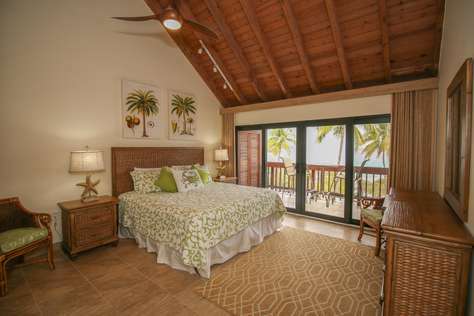 Our villa is the most proximate residence to Magen’s Bay Beach on the western shore, just a short kayak paddle away. Yet, because a dense tropical forest and a rugged rocky shoreline span between our villa and that beach, we are exquisitely secluded. This is just one reason why we believe our location is ideal. In addition, we appreciate that the waters of the bay are calmer and more protected than any others on the Island. This tends to make the water clearer and safer for swimming and snorkeling, especially important when kids are involved. Thirdly, we cherish the beautiful coral reef that thrives along the western side of the bay. This reef is quite isolated and not readily accessible to beach tourists, and so it remains pristine. No other reef exists in the bay; the rest of the bay is predominantly sandy. It is quite uncommon to have a secluded spot where adults and kids can wade out into an ocean that has a colorful and fascinating reef right there to explore, in clear Caribbean waters that deepen very gradually. 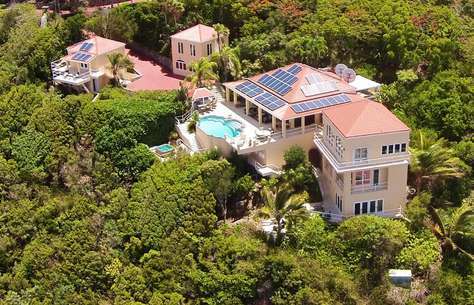 Sand Dollar Estate, the ultimate luxury vacation villa rental in St. Thomas. 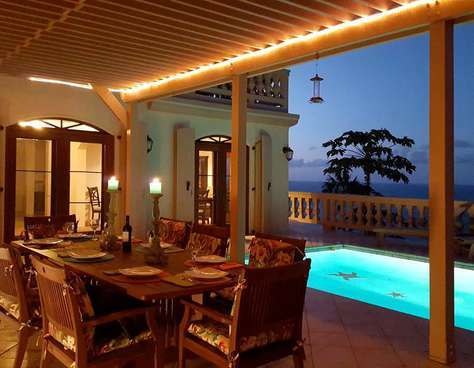 Sand Dollar Estate is a luxury villa catering to guests who desire a truly 5 star experience! 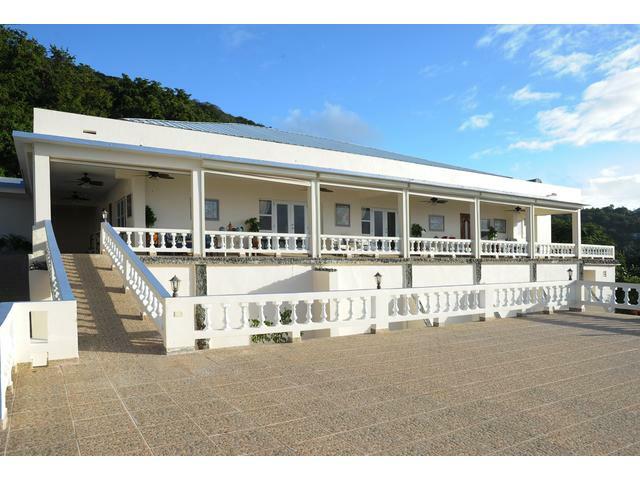 Villa Kyalami, is a contemporary 2-bedroom villa located in Central within minutes of the beach and shopping. This grand, fully renovated villa once housed gala parties attended by famous celebrities. The elegant main level has cool terrazzo floors and features a comfortable, spacious great room with a media room and dining area. Along the harbor side is a long veranda with umbrellas, tables, and chairs for outdoor dining. On the main level is the large air-conditioned kitchen, which is equipped with a professional refrigerator-freezer and a large collection of professional cooking equipment. On the other side of the main level are 2 air-conditioned bedrooms, each with a king-size bed. 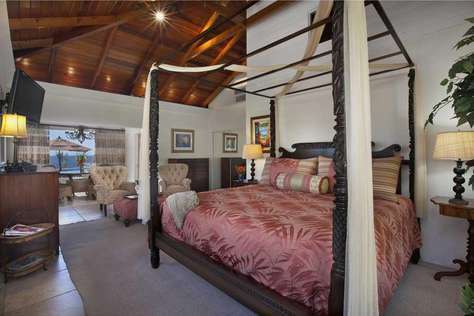 The large master suite has hand-carved woodwork and a marble bathroom with a bathtub and shower. Just off this suite is a small patio with a hot tub overlooking the harbor. A gate connects this patio with the main veranda. The second, smaller bedroom has a king-size bed, ensuite bathroom, and cable TV. A staircase leads down to the garden and pool level, which is enclosed by tall mango, banana, and palm trees. The pool deck is furnished with cushioned chaise lounges, tables, umbrellas, as well as pool floats, a small fridge, and gas grill. An on-site manager and his dog live on the garden level, but are not allowed access to the pool and grill area. 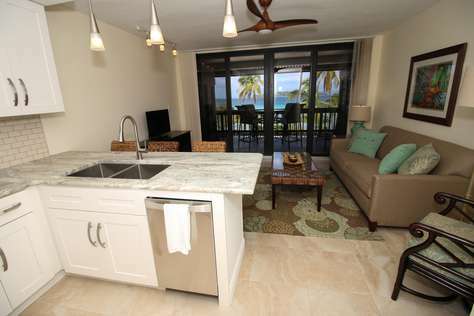 Calypso Delight is the newest vacation rental in St. Thomas! Featuring state-of-the-art upgrades, you and your guests are sure to enjoy your stay in the Virgin Islands at Calypso Delight. Can be rented as a 5, 3 or 2 bedroom*! • Lower apartment has kitchen with convection microwave, stovetop, mini dishwasher, washer and dryer. *You can rent either the main house 3 bedrooms or just the lower apartment 2 bedrooms, or the entire 5 bedrooms. We do not rent the two areas to separate groups at the same time so you will have total privacy! NOTE: Rates quoted are for 1- 6 guests in the main house using 3 bedrooms. The rate increases with the number of guests. Maximum occupancy is 14 (10 adults max). • Ocean-front and down island views! This superb and luxurious home sits atop Picara Point in upscale Estate Peterborg, surrounded by 330-degree sweeping ocean views. Three levels, all beautifully detailed and furnished, offer wonderful panoramas. On Stargate's fully air-conditioned main floor is the Great Room with an impressive arched stone fireplace. 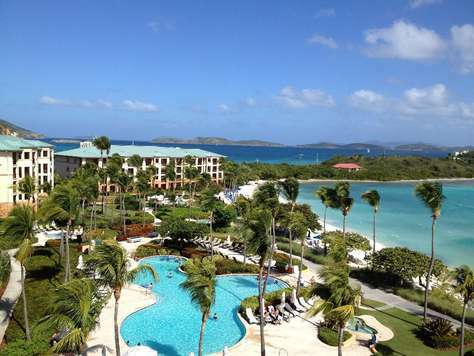 Just outside is a sunny swimming pool overlooking heart-shaped Magens Bay. The main level also offers a formal dining area, a gourmet kitchen with native stone and granite counters and wet bar, a powder room, and two air-conditioned king bedroom/bath suites. French doors open from the Great Room and from the four-poster king bedroom to a spacious deck bordering the entire the Atlantic Ocean side of Stargate, providing spectacular down-island views - miles and miles of breathtaking sea vistas punctuated with islands in the distance. A handcrafted mahogany spiral staircase leads to Stargate's upper level and the spacious, air-conditioned king master suite, offering a private balcony with a view of aqua Magens Bay. The staircase continues up to Stargate's observatory tower, equipped as a secluded office with a DSL + Wi-Fi connection for your laptop and a printer, and with wonderful views from Magens all the way around to the British Virgin Islands and St. John. Below, A manual gate opens to a short driveway and to the villa's attached garage where you may park your rental car. Watch tropical sunsets from the pool, then after a leisurely dinner, move to the deck on Stargate's opposite side. 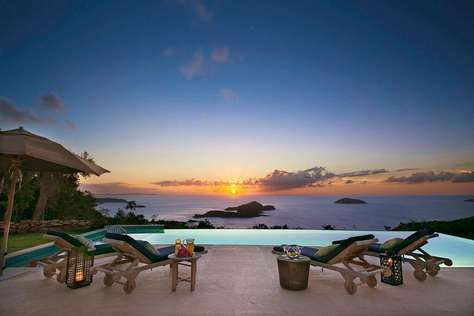 What a spot from which to stargaze or watch the twinkling lights of Tortola. Set atop a breezy ridge, Stargate offers luxurious romance and serene relaxation surrounded by inspiring vistas. 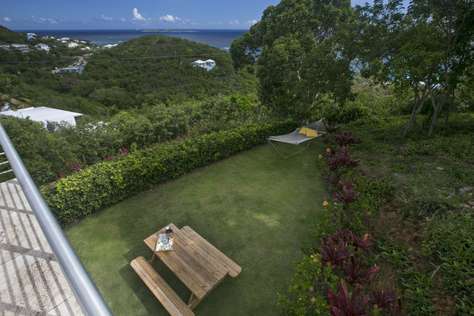 Villa Gardenia rests on a small hill located in a quiet residential cul-de-sac and is a short distance from Magens Bay. Meandering potted plants border this villa’s entry gate. A garden terrace, embellished with a tropical fish fountain, a fifteen hundred foot roofed tiled terrace and brick-lined arches casing ocean views, greets the esteemed guests to this estate. 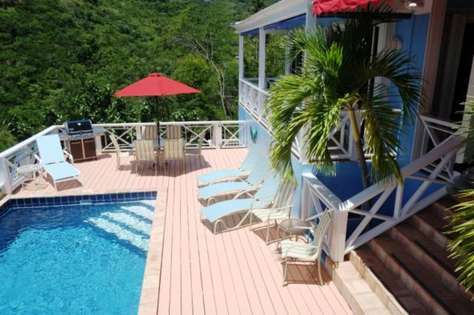 A lovely tiled swimming pool and Jacuzzi overlook the ocean waters and the remote islands of Little Tobago, Jost Van Dyke and Tortola. Chaise lounges adorn the sun deck, giving way to manicured lawns and palm trees. Just mid-level above the sun deck is a lively blue-tiled bar with a built-in gas grill, perfect for cordial evening get-togethers under the sparkling stars of the St. Thomas sky. The interior of Villa Gardenia are designed with traditional furnishings and brightly colored fabrics. There is a charming sheltered terrace, surrounded with potted palms, ample seating and modern grill; perfect for alfresco dining. The kitchen is a gourmet’s pleasure with marble counter tops and state of the art accessories. This villa provides three fully air-conditioned bedroom/bath suites that are opened from the Great Room. A sleigh bed, sitting area and en-suite bath add to the luxury of the master suite. The master also opens to the covered terrace providing sunrises to the honored guests of Villa Gardenia. The remaining bedrooms are adjacent to the master and also offer air-conditioning, en-suite baths and terrace access. 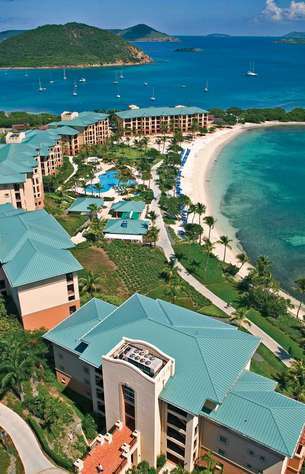 Shopping, fine restaurants and invigorating nightlife are all found on St. Thomas Virgin Islands. Langarra Estate, with its green lawns and constant, welcoming breeze, is part of a historic 300-acre sugar plantation, now the prestigious, secluded 'Preserve at Botany Bay.' Langarra's quiet and private hilltop site overlooks the Preserve's forested slopes, over its inlet bays, and out over the dramatic necklace of surrounding, uninhabited ocean cays and islands -- a 30-mile view. European simplicity combines with West Indian sensuality in furnishings, paintings and details throughout the house. With soaring ceilings above, and cool coral-stone floors underfoot, the light-filled interiors maximize the expanses of sky, sea and garden-green seen from every part of the house. There are four spacious bedroom suites, all with ocean views, large bathrooms and closets, and outdoor terraces. A fifth, queen bedroom/bath suite has its own adjacent living area and mini-kitchen -- perfect for teens, nannies, family elders, or those who may want a bit of separation. Indoor living spaces extend outward onto the oversized, umbrella-shaded terraces. Sunlight enlivens the site from dawn until soaked-sky sunset hours... and our night skies are peppered with stars. A large infinity edge pool overlooks the sea...and moments away on the private grounds of the Preserve, three unique beaches are yours to enjoy, often with no one else in sight: pristine, exquisite Sandy Beach (for sunning, bodysurfing, picnicking) ... and Mermaid's Chair, the dramatic, delicate double-beach (good for swimming, exploring, beachcombing), where the Atlantic Ocean and the warmer Caribbean Sea converge and blend. Close by, the folding lines of waves at Botany Bay are the envy of surfers, and the bay's protected, coral-rich shores are a snorkeler's delight. 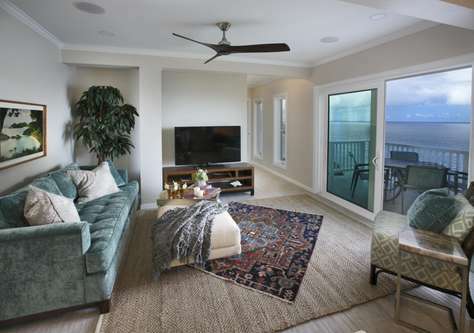 Guests can linger at the bay's open-air, oceanside Beach House pavilion to enjoy the Preserve community's Olympic-sized pool, changing rooms, small kitchen and outdoor lounge terraces. Here, too, under the filtered canopy of a deep grove of tall coconut and mango trees, are the evocative ruins of the 18th century sugar mill buildings that created rum from the sugar cane harvests brought down from the terraced slopes of these hills, two centuries ago. Newly completed in December 2014, Estate Langarra gently combines its fresh spirit with nature's age-old sensibilities. Just a short 20-minute drive away are the attractions of town: world-class shopping, gourmet and casual dining, grocery stores, ferries, entertainment, nightlife, and tours. Each day your choice becomes to enjoy the peace, space, sun, and utter privacy of Langarra and its beaches ...or take time beyond the gates to savor more 'connected' first-world pursuits, albeit island style. 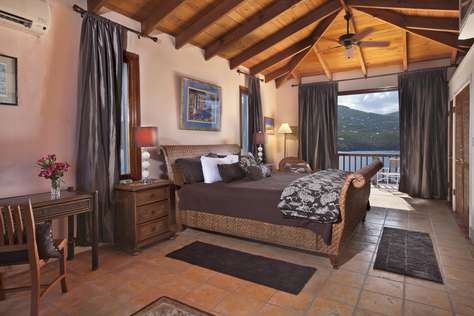 Set on a breezy hillside overlooking the picturesque town of Charlotte Amalie and our harbor, this fully-screened and air-conditioned studio cottage is a bright and airy pied-a-terre for island adventurers and the perfect couple's hideaway. 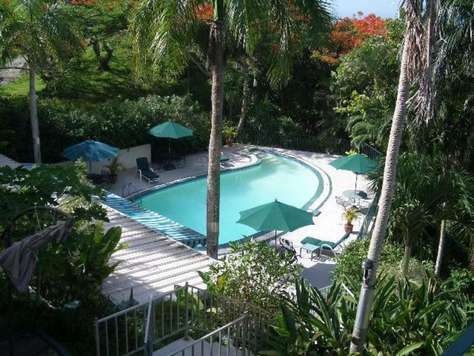 Caribia Cottage is an excellent vacation spot for romantic seclusion. Its convenient mid-island location provides quick access to town, shopping, beaches and restaurants. And the casual indoor-outdoor feel of Caribia Cottage is enhanced by one of the most memorable and dramatic views you've ever experienced - while away the hours watching yachts, cruise ships and seaplanes come and go from St. Thomas's picturesque harbor way below your vacation villa, and enjoy breathtaking sunsets from the deck at cocktail hour.